The marriage of high and low continues to barrel ahead. The latest made-in-heaven collaboration? Costello Tagliapietra and Barneys Co-op, which unveiled a lower-price capsule collection on Tuesday. 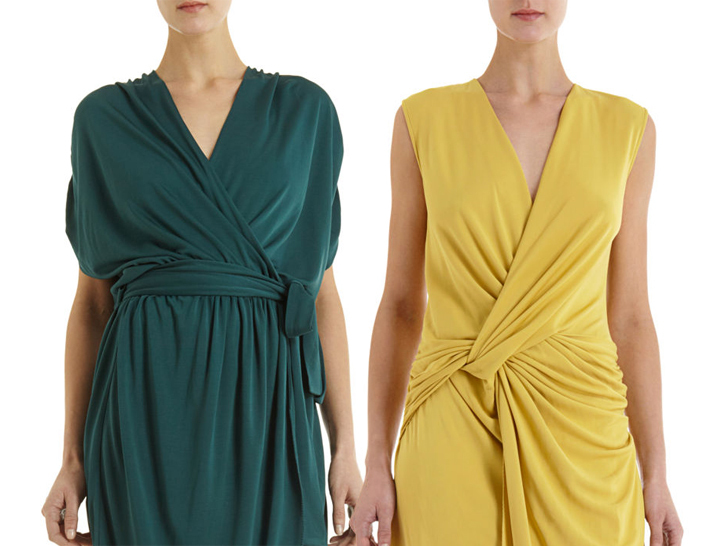 Dubbed C&T, the 15-piece lineup features Jeffrey Costello and Robert Tagliapietra's signature draped dresses starting at $298—not cheap by any stretch of the imagination, but still infinitesimally more affordable than the duo's primary offerings. "It's a love letter to all the women we've worked with who were craving a more accessible form of our brand," they explain. Anchored by a vivid palette of saturated jewel tones (malachite, coral, turquoise), the knee- to ankle-length frocks are ladylike to the hilt. Rayon replaces satin, wool, and cotton jersey, but romantic details still abound. Grecian- wrapped bodices, gathered waist-ties, low scoop-backs, and keyhole cut-outs all impart a deceptively understated, sensual gentility. The knee- to ankle-length frocks are ladylike to the hilt, with romantic details that impart a sensual gentility. The "Iris" dress in rust ($298). The "Iris" dress in yellow ($298). The "Flavia" dress in graphite ($298). The "Flavia" dress in black ($298).